Human beings always think of the thing from the total image. You do not remember the detail but the picture or the keyword so that you can keep the thing in your mind for a long time. To do this properly, you have to remove the unnecessary parts. Why we have to do this unconsciously is that it would be much easier and quicker to bring the information on your memory. Let me show you the example. This description is about the earth you are familiar with. 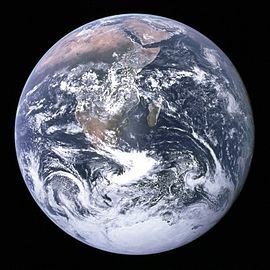 But, most of people would not remember the description like that to think of the earth but would bring the image below. So now, let’s review this image carefully. What I want you to notify is the existence of universe that highlights the main part of the earth. Human beings can focus on the subject because there are enough space as the back ground. Is that much easier to remember the description with the space and line break? And, I also wrote this blog like that. Did you find the existence of the necessary space between my sentences? The key to remember the subject is how to position the space. The space is everything.